Like space opera and romance, the "harem" anime genre is easy to make snooty fun of because most of it is so bad. Sometimes on purpose, often unintentionally. But just because the bulge of the bell curve ranks high on the kitsch index doesn't mean there's nothing on the "amazing" meter a few standard deviations out. At one end of the harem spectrum, for example, is Elfen Lied, a blood-spattered S/F horror series. And at the other is one of the most poignant romances--and most complex psychological dramas--I've ever seen, with a demanding, multi-layered narrative structure that indeed deserves to be described as "literary": Kanon. 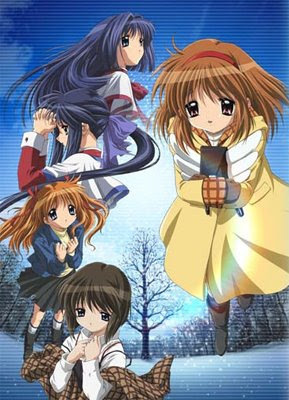 The story has a long and twisted pedigree (though not that uncommon in anime), having originated as an "adult" video game in 1999 (a "visual novel," for which there is no counterpart in the U.S. gaming market), then a G-rated version, and consequently as a light novel series, a manga series, a drama CD, and two anime series. But it was the latest--2006--version produced by the innovative Kyoto Animation, directed by Tatsuya Ishihara and written by Fumihiko Shimo (who penned three episodes of The Melancholy of Haruhi Suzumiya), that molded it into an authentic work of art. Voice actor Tomokazu Sugita also deserves a lion's share of the credit. Sugita is probably better known as Kyon in The Melancholy of Haruhi Suzumiya, the straight man to the frenetic Haruhi, the grounded center of whatever maelstrom she's cooking up next. Haruhi's world is so unhinged that it's all Kyon can do to keep it from flying apart. In the process, though, we don't have many opportunities to invest ourselves deeply in the fate of the characters themselves. As in any madcap sitcom, we always expect some crazy rabbit to get pulled out of the hat by the time the credits roll. That's a good part of the fun, but at the end of the fourteen-episode run, it seems more that the writers wrote themselves into one too many corners than the story came to a carefully scripted conclusion. Like a Mobius strip, you could feed the last episode into the first one and start the whole thing all over again. I highly recommend the series for its quirky exuberance, Sugita's straight-man performance, the dance number in the opening credits, and because its general craziness inspires equally inventive fan analyses. The individual parts aren't only greater than the whole, they're often downright brilliant. Kanon, though, exists as a completely realized artistic effort from beginning to end, where the characters are so changed in the process that there is no going back. It may not seem that way at first, as Yuichi's unflappability comes across as too nonchalant, given the quirky, illogical nature of the events around him. But this is on purpose. Nothing in Kanon happens for lack of a better idea at the time. As the story begins, Yuichi Aizawa (Sugita) has moved to snowy Hokkaido to live with his aunt and niece while he finishes his senior year in high school. He initially comes across as an unusually normal teenager, more a counterpart to John Cusack's Lloyd Dobler in Say Anything than the typical teen romantic lead from anime-land. Unlike the neurotic, clinically introverted, "lesser male" harem protagonist, Yuichi has reasonable good sense of himself, is prone to reflection rather than panic, and doesn't turn into a tongue-tied imbecile around girls. He's pretty much a rock, if a slightly cynical one, a more extroverted and involved "Kyon." To be sure, few teenage boys of any stripe are that calm, cool and collected. The neurotic "lesser male" of harem comedies is probably closer to reality. But as Ron Rosenbaum quips in Slate, "I hate characters I can identify with. I read to escape myself; I'm tired of my identity." However, it does turn out that Yuichi has one thing very wrong with him: he's forgotten practically everything about the last time he lived there. Still, he treats this massive case of amnesia with suspiciously good cheer as he becomes reacquainted with a half-dozen girls who know him for important reasons he can't remember. The series proceeds with a series of interlocking stories about how each of their screwed up lives (varying from "somewhat" to "a lot") relate to Yuichi. Little by little these experiences pry open the lid of his memories and the tragic truth we suspect lies at the heart of it. And the brilliant gem of hope that resides there also. Uniting these stories is the series-long arc about the mysterious Ayu Tsukimiya--who runs through the closing credits wearing a knapsack sporting a pair of wings. She shows up at first as comic relief, but as the other variables fall away she moves closer to the center of the story, just as Yuichi moves closer to the truth about himself. To be sure, a staple of the Hollywood melodrama, from Rebel without a Cause to Ordinary People to Good Will Hunting is the angst-ridden young man with the troubled past who works through his "issues," usually with the help of empathetic shrink and a faithful girlfriend. Not to denigrate the genre (I liked the aforementioned movies), but it's awfully solipsistic stuff, all about how tough it is being me and how much I deserve to be loved because nothing bad that ever happened to me is really my fault. As the credits roll, we cheer the resurrection of the protagonist's self-esteem. There's not a shrink to be found anywhere in Kanon, which argues instead that the one effective way to work through your "issues" is to do good by others. I know, even writing that it sounds saccharine. This is where Fumihiko Shimo's script and Tomokazu Sugita's performance carry the day. Like Hugh Laurie's Dr. House, Yuichi doesn't run around doing good because he's a selfless altruist brimming over with charity for his fellow (wo)man. Rather, like House, he's drawn to the people he ends up helping out of curiosity about their plights and about his own curious mental state. And does more good as a result. "Well, this is an interesting development," you can all but hear him thinking. So when the ninety and nine finally band together to care for the one, it comes across as authentic. In fact, the whole series could be read as an argument for why, in the final episodes, a bunch of teenagers should act so selflessly. Kanon ultimately only makes sense after you've seen it. The pieces won't fall together until they're all there. Along the way, it can be treated as fantasy, magical realism, or straight psychological drama. In comparative terms, Orson Scott Card's Lost Boys springs to mind, as does The Sixth Sense. Like The Sixth Sense, Fumihiko Shimo relies on the viewer jumping to the wrong conclusions. Still, he tips his hand early on with an updated version of "The Fox Wife," a classic Japanese fairy tale. This story-in-a-story creates the lens through which the rest of the series should be viewed. If you would forgive the spoiler, what we have been watching all along are the stories Yuichi told Ayu while she was in a coma at the hospital. Except that, aside from one key scene, the points at which the surreal invades the real aren't clearly delineated, and that's fine with me. As Fox Mulder would put it, I want to believe. Storytellers who build castles in the air and then preen as they shoot them down annoy me. If the castle's floating in the air, I know it's a castle in the air. As a case in point, does Mai possess healing powers, or is that a literary device too? Or another story-in-a-story? Hey, stop overthinking everything! There's no overthinking the message of Kanon, though. Contrary to the assurances of the pop psychoanalytic culture, a true understanding of the self comes not from discovering your inner whatever, but from looking outwards at the rest of the world and examining why it is there and what it has to say and dealing with it.